EAST LANSING, Mich. – Both civil airlines and the military have successfully used camelina oil blends to fly airplanes. Camelina is not a significant food crop. So why doesn't the oilseed plant compete with petroleum products? Small yields. Michigan State University will lead a $10 million U.S. Department of Energy grant to explore ways to boost this promising biofuel crop's yield. "Current seed-oil based bioproduction relies heavily on food crop species, such as soybean, sunflower and canola oil," said Danny Schnell, MSU plant biologist and grant coordinator. "Camelina doesn't require as much water as these crops, it grows quicker and it has a higher resistance to pest and disease. By focusing on some key genetic control points, we're hoping to unlock the relationship between carbon capture and increasing oil and seed production." Schnell is part of an interdisciplinary team, which includes MSU scientists Erich Grotewold and Yair Shachar-Hill, that will study camelina's metabolic and gene expression networks. Together, the scientists will generate metabolic models to predict how the plant is converting sucrose, the product of photosynthesis, which eventually produces oil. The team's overall goal is to achieve up to a 300-percent increase per acre in oil production. Traditional breeding approaches could take as long as 20 years to produce positive results. Taking a genomic approach could cut that time in half, Schnell said. Camelina, when compared to canola, has a smaller genome and it's easier to study and engineer. Identifying what genes control key mechanisms should be less complicated than unraveling the genetic control panel of canola. Camelina also serves as a model plant, meaning that it's genetically similar to other important oil-producing crop plants. "Once we understand its structure, we'll be able to share it with other researchers working with different plants," Schnell said. "This will give them the architecture and vital genetic targets in the areas they research, such as how their plants' metabolic and genetic programs respond to changes in the environment." Along with aeronautical fuel, camelina oil can be used in a number of other bioproducts, including nutritional and potential pharmaceutical, cosmetic and other products. Additionally, it can be grown on agriculturally marginal lands, requires less fertilizer and doesn't take special equipment to be planted or harvested. This should appeal to farmers, who'll be able to add this crop to their rotation with existing agricultural implements and practices. MSU, being the nation's premier land-grant university, is the perfect place to conduct this research, Schnell said. 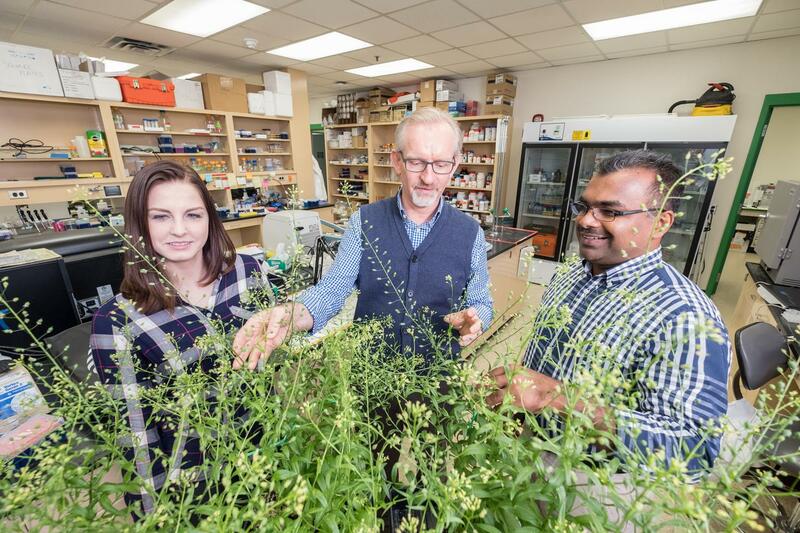 "MSU has a long history of researching camelina, thanks to John Ohlrogge and colleagues, who conducted some important work with how the seeds produce oil," he said. "No one has looked at the plant's whole system before. Interdisciplinary research thrives at MSU, and we're bringing many diverse researchers together to map these systems." Ohlrogge, professor emeritus and University Distinguished Professor in the Department of Plant Biology, was recognized last year as a Thomson Reuter highly cited researcher. Additional scientists, Heike Sederoff, North Carolina State University, and Kristi Snell, with Yield10 Bioscience, will be part of the research team as well.